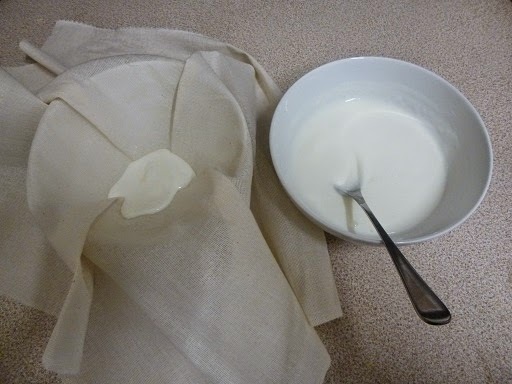 cream cheese out of yogurt. It not only tastes great, but is incredibly easy to do. fork out at least 49p or so on value soft cheese, but just 45p to 50p on a big 500g pot of value range natural yogurt. and some to make cream cheese like this for sandwiches. Natural Kitchen Adventures, at the end of her post here, and made some more yesterday. You can find her whole Live Below the Line Resource pack here, listed under “Ceri’s Wholefood Recipes”. 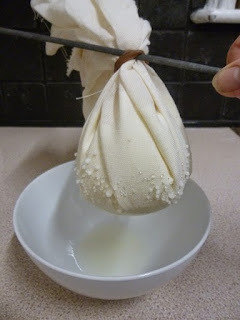 The yogurt cheese, known as labne, is on page 10. Fancy salt grinder from Aldi but any kind of salt would be good. 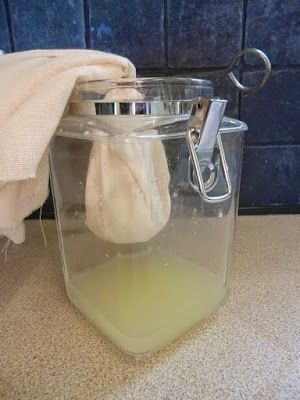 you could use a cheesecloth, a clean tea towel and even a pair of old tights as well. an elastic band round to hold it together. down inside a jar, and the skewer/stick/handle will keep it suspended. 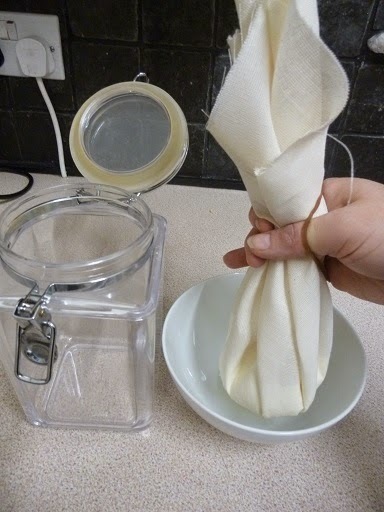 the yogurt (whey) will drip down into the bottom of the jar. Give the material a quick squeeze, if you want to force out more whey and make the cream cheese a bit thicker. 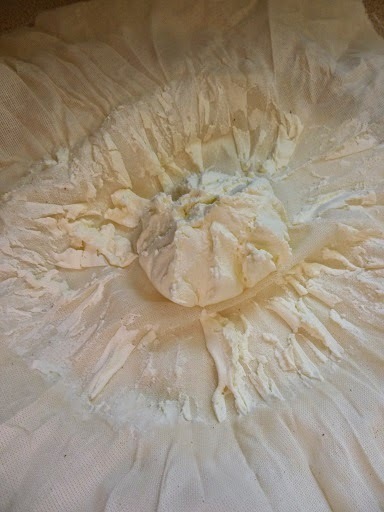 When you open the material, you’ll find a ball of soft cheese just waiting to be spread on sandwiches or whatever you fancy! 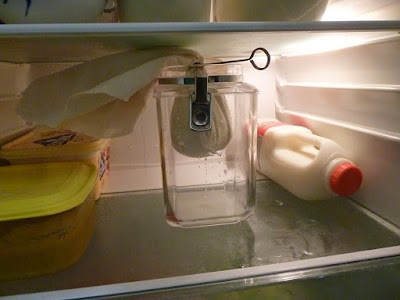 Cheese from 300g yogurt, with whey in the jug. 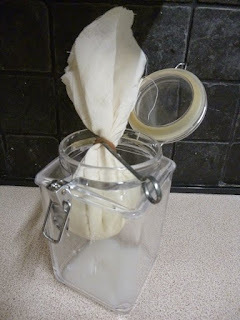 I transferred the cheese into a plastic box and used a knife to scrape off any remaining cheese from the muslin. As you can see, the 300g of natural yogurt ended up as 125g soft cheese, plus an additional 150ml or so of whey, which Ceri reliably informs us can used for things like soaking porridge oats or whole grains to make them more digestible. 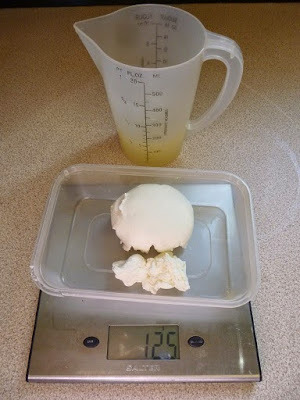 So I ended up with 125g cream cheese by using natural yogurt that cost about 30p. safe, fed and healthy, including their response to the earthquakes in Nepal. Previous Post Live Below the Line: still time to take the challenge! If you like soft cheese like Philadelphia, it really is worth giving it a whirl. 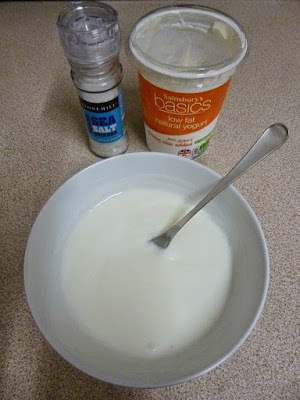 I've used the yogurt cheese in sandwiches, on bagels and on jacket potatoes. 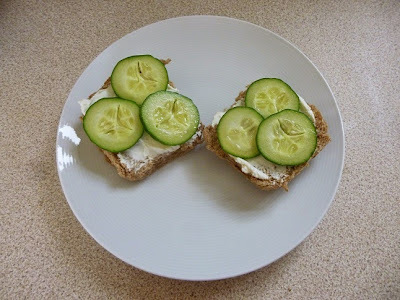 Suspect it would also taste good mixed with tinned fish like sardines, as another sandwich filling.